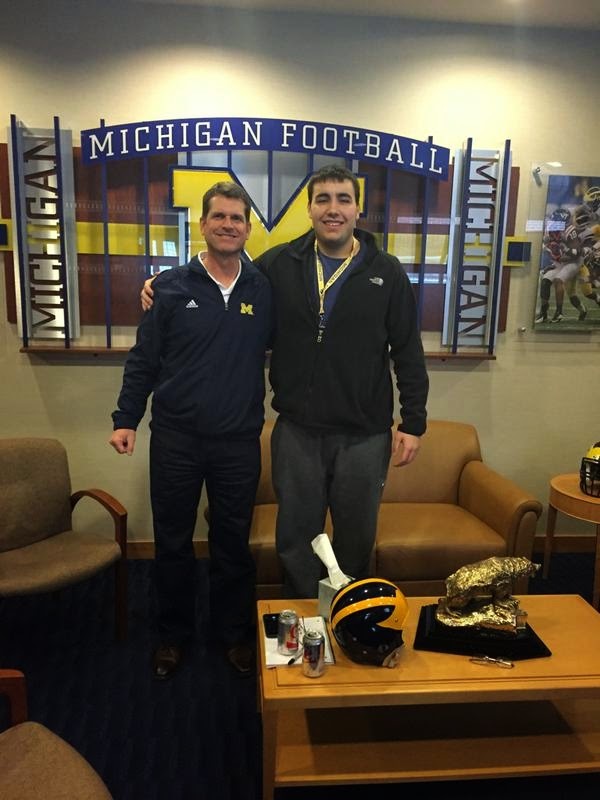 On Sunday, 2015 offensive tackle Nolan Ulizio (West Chester, OH) took to Twitter to announce that he has flipped his commitment from UConn to Michigan. Nolan, becomes the third commitment of the weekend, as 2015 DE Reuben Jones and 2015 QB Zach Gentry committed to the Wolverines on Saturday. After going 85 days without a commitment, Michigan has now landed three in less than 24 hours. It’s not very often Michigan does offer a 2* prospect, but when they do, you have to feel as if the coaching staff see’s something in the recruit that other schools don’t. Nolan has the prototypical size to play tackle at the college level (6’5 295 lbs. ), and although his highlight film doesn't jump off the page, he does a lot of good things on the football field. Comparing his junior tape to senior tape, it’s easy to see that Nolan has made lots of progress in turning into a better football player. He gets off the line of scrimmage with decent speed and has a very strong upper body. Good arm length. Nolan is equally as good in pass protection as he is protecting the running back. Very athletic for someone his size, and plays with a high motor. Very aggressive on the line of scrimmage and loves to initiate contact. In my opinion, Nolan has a very high ceiling and could turn out to be an offensive line starter later on in his college career. A redshirt will almost be necessary, but that will benefit both him and the team. Nolan becomes the 9th member of Michigan's 2015 recruiting class joining; QB Alex Malzone, OT Jon Runyan Jr., K Andrew David, DE Reuben Jones, OT Grant Newsome, S Tyree Kinnel, ATH Brian Cole, and QB Zach Gentry. With Michigan landing three commitments in the past 24 hours, the coaching staff will likely focus their attention on landing 1-2 more DB's, 1 OL, 1 LB, 1 DE and 1 TE.